It’s been a good long time since I’ve posted a new vlogisode, but when I heard this new song by Tegan and Sara I knew it was time to leap back into action. It’s been a busy, inspiring fall and I decided to create an autumnal recipe for breakfast this morning with my friend Kate. Ingredients – 1 sweet potato, 3 large carrots, 1 medium onion, 1/2 cup chickpea flour, 1 tablespoon cornstarch, 1 teaspoon cinnamon, 1 teaspoon coriander, 1/2 teaspoon salt, freshly ground pepper, 1/4 cup water, coconut oil. 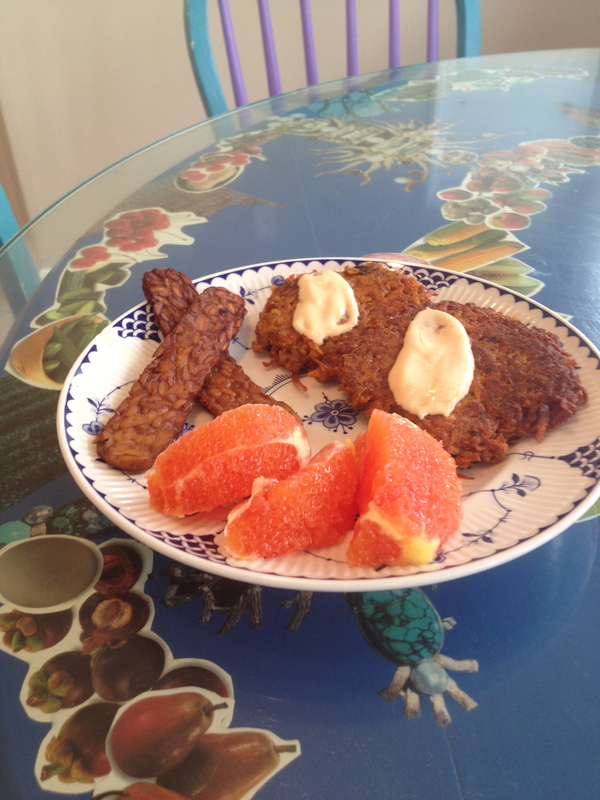 Autumn pancakes with tempeh bacon and orange slices. Peel and chop the veggies and then grate them. I used a food processor to make this go faster. Put the veggies in a bowl and mix in all the other ingredients, adding the water last. Heat about a 1/4 inch of coconut oil in a cast iron skillet. Spoon in pancakes and let them cook for about 5 minutes on each side before flipping. When you finish a pancake put it on a paper towel to soak out the oil. Serve with your favorite sauce (I used veganaise + sriracha), tempeh bacon strips and orange slices.